Many shipyards, both large and small and mostly European, are rushing to launch quite large open-type yachts, up to 120-130 feet in length. The scenario has changed from some time ago when production focused on hulls of a maximum of 70-80 feet and when there was really only one French shipyard producing a line (designed in Italy) of large 'opens'. One wonders where they've come from, all these yacht-owners who want such large yachts. The reasons for buying a boat with these characteristics stem, I believe from two factors which are closely connected: the desire for admiration (and therès no doubt that when you sail into harbour in such a boat you won't go unnoticed) and the desire to have boats which are 'simpler' than classical motor yachts and which can be handled with smaller crews, making it easier to cope with the sea. The large opens have many attractive features and a fair dose of natural style, not difficult to achieve on boats which are long and low; in addition they have a layout which makes it possible to live 'en plein air, in contact with the elements. Apart from some 'sad' improvisations to opens obtained simply by cutting motor yachts, in other words not installing the fly and partially altering the bridge house - resulting in a 'train carriage effect - shipyards have come up with stimulating boats which have been radically designed from scratch, given that this is a relatively new kind of hull. In reality, it is historically linked to several large boats built between the thirties and forties in the United States, commissioned on a design by several large families who used them for daily trips in the harbours of North East America, where the American 'aristocracy' have their homes. These boats have a vocation for day tripping. Normally their owners use them for brief periods, always in the middle of the summer season, which conjures up an idea of a boat with lots of outdoor space. 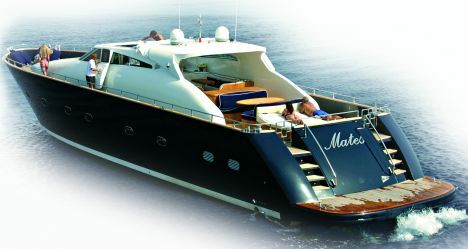 However, many boats on the market contradict this relaxed, sea-faring spirit and offer cockpits which are quite small in relation to the overall size of the yacht. Sometimes, in fact, the superabundant space of the lounges is out of proportion to the skimpy cockpits which have very little useful space aside from the sundeck. But not everyone likes to lie in the sun. In actual fact, most guests prefer to sit comfortably, perhaps with a delicious drink in their hand. Whichever way you look at it then, the cockpit is always the real fulcrum of the boat, whether it measures 30 feet or 30 metres. 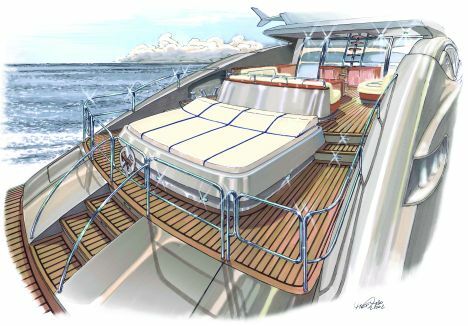 The cockpit, hopefully protected from the sun, represents the core of the yacht, the natural link between the sea and the interior, just like the veranda of a beautiful villa on the beach. All the yacht-owners that Dan Lenard and I have met have always requested and sometimes demanded large cockpits. It is therefore something of a surprise to me to see that many shipyards are going in the opposite direction. 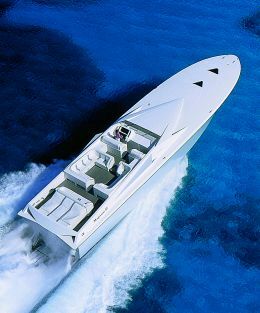 Contrary to what you would expect, the speed of these yachts may not be the focal point of their design. All, however, offer a decent performance, from 30 knots upwards, achieved with sub-cavitating propellers - normal shafting - and with surface and water-jet, the latter being greatly favoured because of the lack of vibration and the reduced draught which is essential for customers who use boats in extended shallow areas such as the Bahamas. Yachts have been built with gas turbines from the aeronautics industry, coupled with water jets as well as surface propellers, systems which are quite common in the navy because they are extremely efficient but also very delicate to design and handle. Some of these yachts have surprisingly flat bottoms which is something I don't agree with at all. 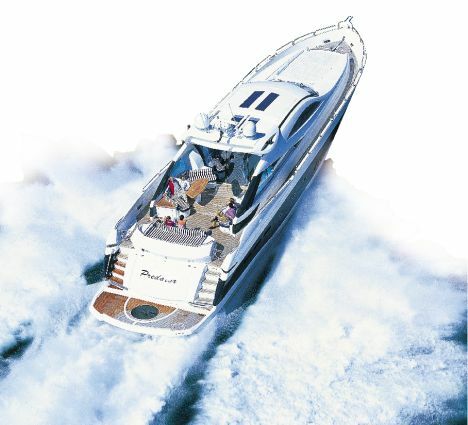 It is true that in this way you can reach a greater speed with less power but considering the performance and mass in play on these yachts, the structure is placed under considerable stress and damage to the internal fittings is not uncommon. Naturally the comfort of passengers is reduced as a result. I believe that the technical know-how of leisure craft owners is increasing and the need to offer them performance yachts with a power which is acceptable - for economic reasons of course - must be met with sophisticated technical solutions with an increase in propulsion efficiency and limited weight. This, after all, is the right way to go about designing and building any kind of yacht.